Max and his family are ready to embark on an adventure vacation, except Max does not really want to go. They are going to the outback; Max is deathly afraid of crocodiles. His older brother Charlie delights in frightening him making matters worse. Mom and Dad insist that he must overcome his fears. Max’s fears are confirmed when he falls overboard and must escape the crocs. Charlie and his brother will have to flee for their lives more than once, and Max narrowly escapes death when he falls off a cliff. Charlie and Max are typical brothers who are constantly competing with each other, yet deep down love each other to death. On the journey, the boys will meet up with another family who appear to be dauntless and unafraid. Upon their insistence, the two families climb up the Uluru. Will they be able to make it down again safely? Will Max be able to overcome his fears and insecurities? This is the second book in this series targeted for middle grade readers ages nine through twelve. Lots of adventure, sibling rivalry, competition, and somewhat complicated family relationships keep the plot moving. Boys especially will find the series interesting. 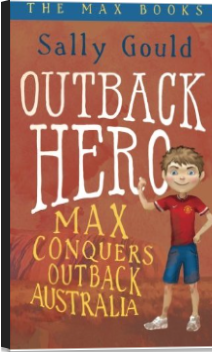 Readers unfamiliar with Australia will enjoy learning about the outback. While the text is age appropriate, the vocabulary is not overly difficult and the length at less than 150 pages allow the read to be appealing for reluctant readers. This is a series worth investigating. I don’t want to assume you might read it but if you are interested I’m happy to send you a pdf. My email address is my full name at gmail dot com. This book looks really interesting and I think would fit well with our study of Australia later this school year! Thanks for sharing it at Booknificent Thursday! Oh, yes….definitely taught me a lot about Australia, a country with which I am not overly familiar.